As they were being deported to concentration camps, Némirovsky and her husband, like so many other German Jews, sent their two young daughters, then five and seven, to live under assumed identities—in this case in a Catholic boarding school in the south of France—which enabled them to survive the war. The younger daughter, Elisabeth Gille, became a well-known French publisher, and chronicled her wartime experiences in her own novel, Shadows of a Childhood. Originally published long before the manuscript of Suite Française was discovered, Shadows of a Childhood is now available for Némirovsky fans who want to know more about the circumstances of her death and her daughters’ survival. Gille’s haunting novel is a moving sequel to her mother’s masterpiece and an important part of an extraordinary family’s literary legacy. 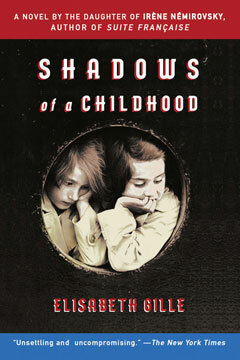 The daughter of Irène Némirovsky and one of France’s leading literary editors, Elisabeth Gille (1937–1996) wrote three novels, of which Shadows of a Childhood was the first to appear in English.